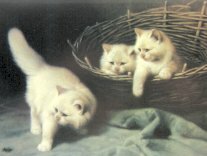 The manufacturer describes the image on this card as "white angora kittens with a beetle". This Victorian cat greeting card is blank inside and it is 7" wide x 5" high. Envelope included.